Remember how on Thursday I was all, “This race has no pressure, I’m totally okay with whatever I run”? Yeah. I’m a big, fat liar. Ready to run, trying to keep my coffee down. In my opinion, 9 am is a little late for a race start. I had already been up for hours and I was beyond antsy to get going. We watched the super cute kid’s race go at 8:30, then the 10K went off (a few minutes late, because they were waiting for all the kids to clear the course) at 8:55, and then it was finally time for the 5K at 9:10. This race was tough right from the get-go. The first stretch was a really steep downhill (which of course would be the last gasp uphill at the finishing chute! ), with a sharp right turn followed immediately by a sharp and narrowing left turn with more steep downhill and then another sharp right turn. Yikes! I positioned myself a little off the starting line because I knew I wouldn’t be able to go out super fast in those conditions. 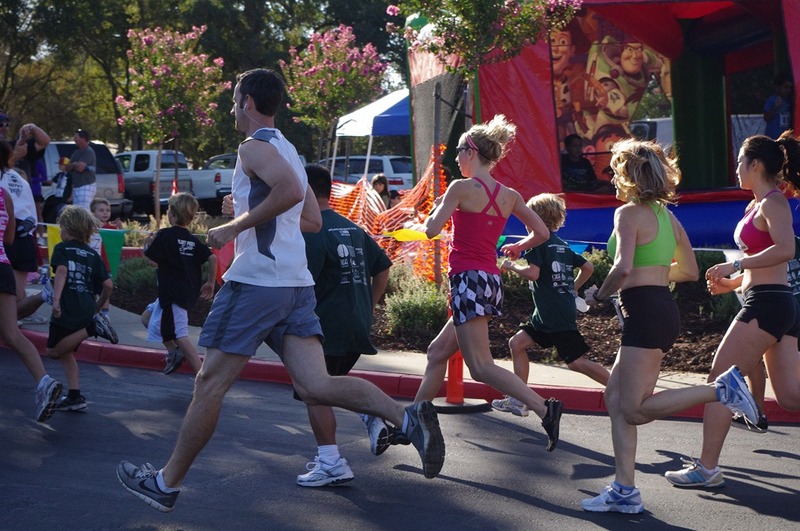 There were lots of kids at this race. They all started right in front of me and all but one of them came to a screeching walk after about a quarter of a mile. That wasn’t annoying at all. Navigating the last sharp turn. You can see that lots of people passed me on that first downhill section. It’s okay, I caught most of them later. After that first part, we settled in to some gentler turns with some mild climbing. I felt good and I started passing people. The hills kept coming, sort of like stair-steps: climb for a bit, then level off, then climb some more. This was fine by me, as I’m not a strong downhill runner. None of the hills were overwhelming by themselves, but they definitely had a cumulative effect. About half a mile in, the crowd had thinned out and I found myself hanging out behind a group of cross-country aged girls and one very young boy. I could tell I was gaining on the group, but I didn’t want to waste the energy to go around them, so I sort of crept into the middle of them instead. They parted like the Red Sea and I kept running hard. One girl hung with me and we both hung with the little boy who was still running strong. It took forever to get to the 1 Mile mark. There was no end to the hills and I was wondering if I’d gone out too hard. “Wondering” – ha! – I always go out too hard! What I was really wondering was whether or not I was going to crash and burn before the turnaround. I glanced at my Garmin, though, and I went from thinking, “This is too hard,” to thinking, “OMG, I’m holding a sub-8 pace on these hills? I rock!” That mental boost kept me pushing. Just after the first mile marker, I could see the lead runners coming back. As I approached the turnaround, I saw the lead girl. Wait, what?!? I was second place female?? Oops, make that third place female, since my little cross country friend was back in front of me again. But, still. After we turned around, the course became net downhill, which was a huge relief. 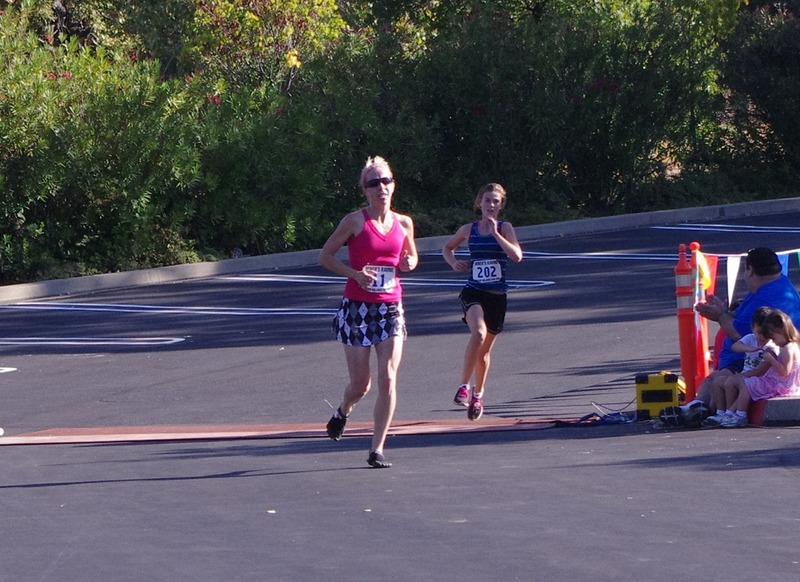 I tucked in behind the XC girl and the little boy and we hammered back toward the finish. 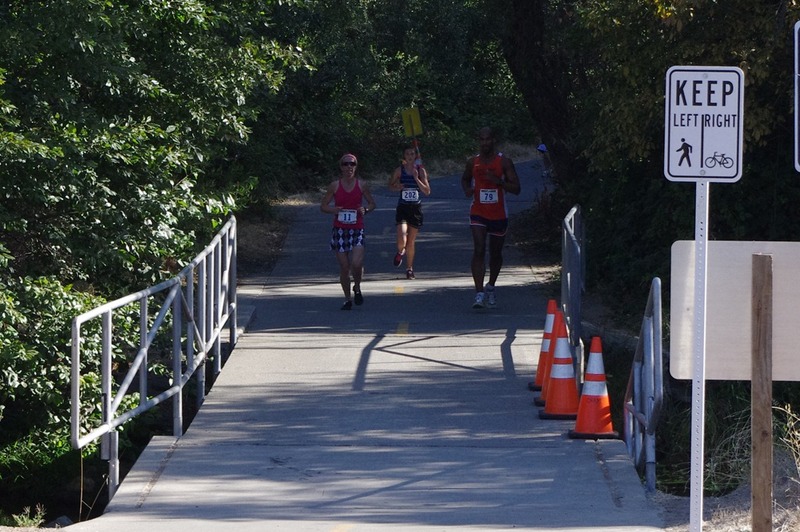 Right about Mile 2, a little girl (seriously, she was 8 years old!) went flying past us. I was already giving it everything I had, so I let her go. 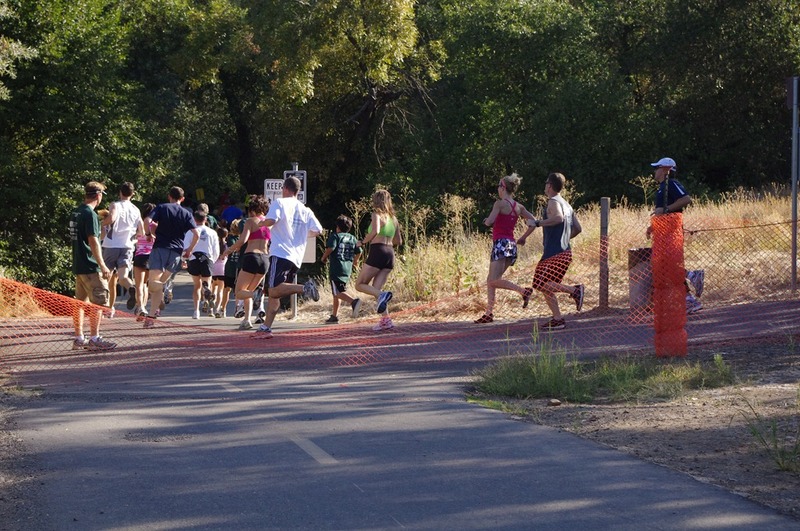 Around Mile 2.5, I could feel both the little boy and the XC girl starting to fade. Both of them were suddenly breathing a lot harder and slapping their feet a little more. I had a total “Mom moment” though, and didn’t want to pass them! After a few seconds’ hesitation, I knew I had to push myself to do whatever I could, even if it meant passing children, so off I went. There was one more guy up ahead and I really wanted to reel him in. Gotcha! I passed the guy right before the last two big uphill sections. Final turn, giving it every single thing I had. You can see how much it hurt! Cross-country girl had more. 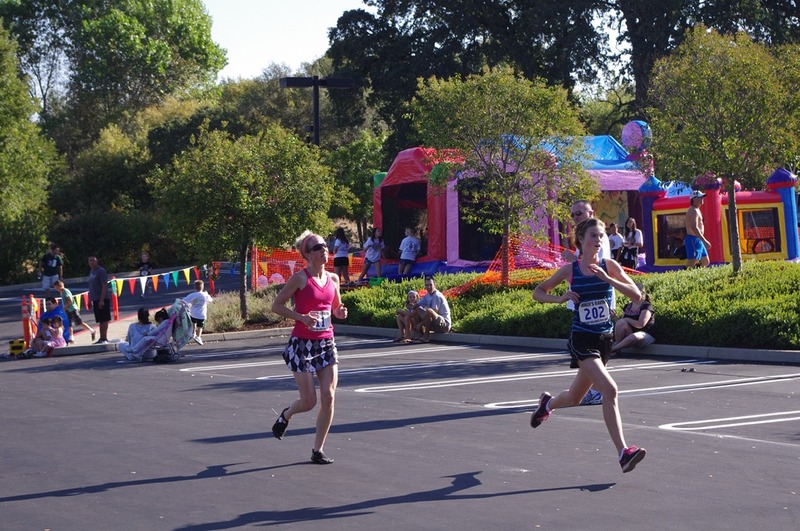 It was a family venue, so I kept it quiet, but here’s photographic evidence of me dropping an F-bomb because I just got passed in the finishing chute! Ha, ha!! The agony of defeat was incredibly short-lived, because right about then was when I saw the clock! I knew I was a little off the start, but didn’t know how many seconds. Could this be a PR??? 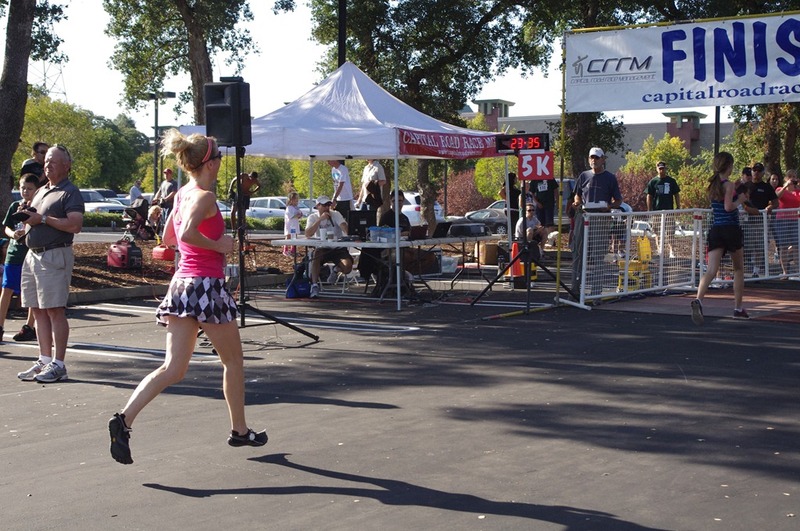 I came flying up to the Finish Line, stopped my Garmin and checked my time – 23:35. Holy smokes! But I still didn’t know if that was a PR! I couldn’t remember! 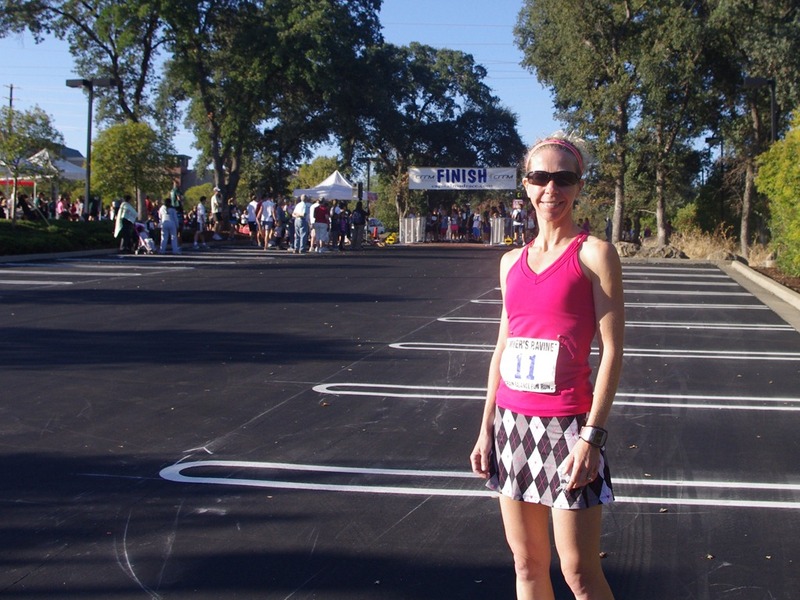 I grabbed a water and a bagel and racked my brain to remember if my PR was 23:35 or 23:36. Either way, today was huge, but I made IronHubs look it up on his phone. While he was doing that, they posted race results and it turned out that I PR’d by two seconds!! 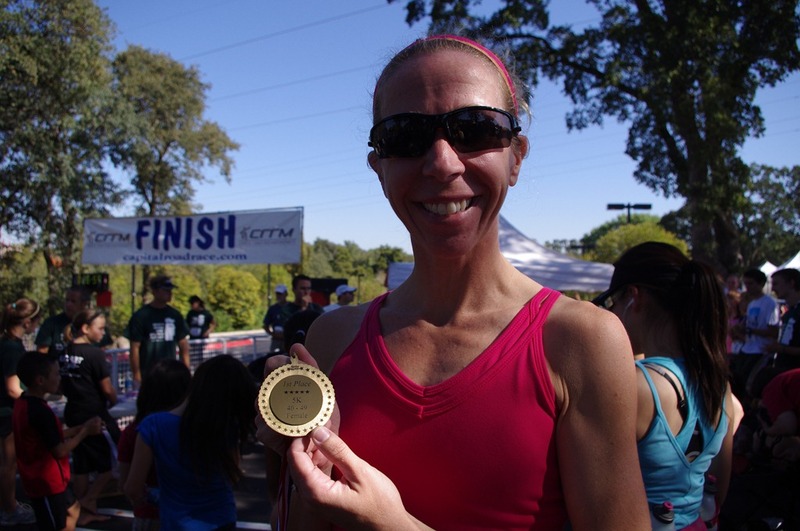 Making the day even sweeter – really, making my YEAR even sweeter – was the fact that I won my age group! Boo-yah!! I know good and well that 23rd overall, 4th place female and 1st in my age really just means that all the fast girls were racing elsewhere today (seriously, there were like four local races to choose from this weekend! ), but the two second PR? That was my hard work, and I’m going to bask in the glory of those two little seconds until my next PR. How was your weekend?? Anybody else shave two seconds off their previous best?? Great race! I was rooting for you to beat those young things but 4th is still awesome and a PR to boot. LOVED that race report – it was very exciting! Congrats on your PR! What a great feeling. Congrats on your PR, P! And I think I see some ink. That is awesome! Congratulations on rockin’ your PR! Congrats on your PR!! and the place!! 🙂 🙂 🙂 GREAT race! Congrats on your PR, and first place in your age group! Wow, congrats! You rocked it (also, your outfit is seriously stylin’)! Nice job and don’t downplay everything. Take those placements with pride. P- I love when you PR! Awesome on the AG 1st!!!! The whole thing about “do I pass an 8 year-old?” made me laugh. Congrats, your form looks fantastic in the pictures!! Great job and report! congrats on your PR and age group win! woohoo! I am the little boy who ran with you (I am 8 years old) I also PRd by 30 seconds! Great day! My daddy was the race director so thanks for choosing his race. See you next year. OMG!!! You are such a stud! Does this totally make you wonder how many seconds you could shave off your PR on a FLAT course?